A Side of Librarian: SCIL Works 2013: Hack Your Library! SCIL Works 2013: Hack Your Library! The California Academic and Research Libraries (CARL) chapter of Southern California Instructional Librarians (SCIL) held their 2013 Works program at CSU San Marcos' Kellogg Library. Beyond the welcoming atmosphere, great food, and well organized program, the event was very helpful to me. There was plenty of time to network with other librarians from libraries across Southern California (perhaps 40 in attendance), some whom I had not spoken with since the previous SCIL Works. The two Research & Practice Sessions I attended (Library Instruction Style on a Budget & Instruction Roulette), in combination with the Lighting Rounds, gave me valuable insight and tools to implement and adapt to my own instruction. This session covered Lucy's instructional experience in which she and other librarians dealt with a less than adequate learning environment: a lab with only a projector from the lectern computer and desks for the students. Without the opportunity for students to research on their own, Lucy adapted an exercise from The Library Instruction Cookbook titled "The Coffee Can Appetizer." The gist is to put representations of information resources into coffee cans that represent what is available Google vs library databases to show the benefit of using databases. 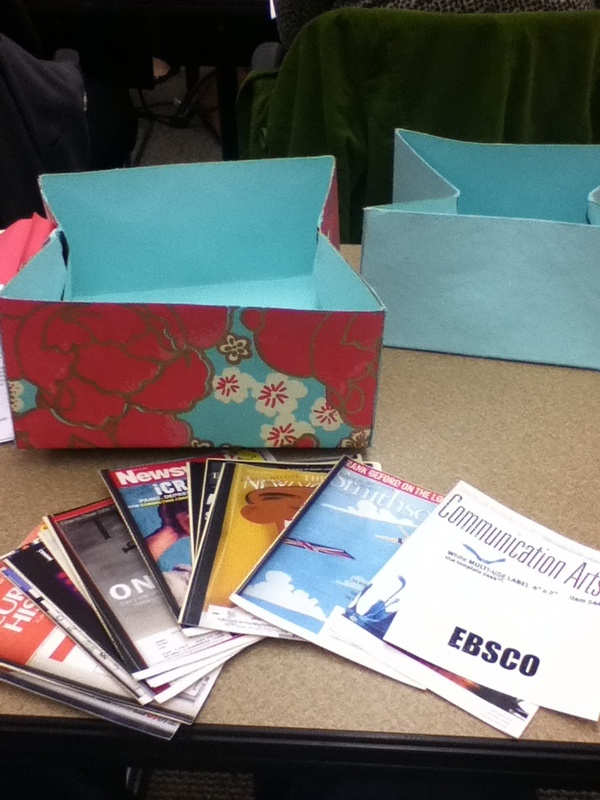 Considering the demographic of students at FIDM, fabric boxes were a big hit. 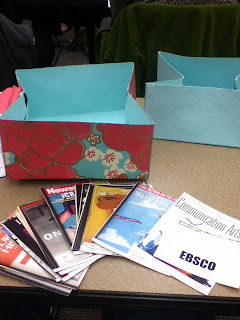 The students were divided into groups and each given a box to open and explore (see a box in the picture below). The library instructor would then take suggestion for resources given different types of prompts for research questions and then show on the screen the ropes of searching the database for those resources. Evaluations of this exercise by students and faculty led to better funding and eventually laptops in the lab which allowed for incorporation of hands-on student searching into the fabric-box exercise. Overall, I was happy to have attended this session because it showed a creative solution to a common issue for libraries. Engaging students with tactile, group work that over comes the dominant paradigm of passive student listeners is a way of improving library instruction. This session really kept us on our toes! We were divided into three groups to role play in 6 minute mock one-shot instructional classes. One group member was elected the library instructor, making the rest students. The one-shot class scenario was described to the group by Michelle and Brena and then the library instructor was given a minute or two to create a quick lesson plan. The role-play began with the "library instructor" addressing the class and trying to explain the lesson plan to the "students." The catch was that the session facilitators walked around the room and handed character cards to random students. These character cards included the Sleepy Student, Cell Phone Student, Disruptive Student, and Model Student. One of the character cards also transformed a student into the Helpful Course Instructor. As a student in the first round (and my dean, Pearl Ly, as the library instructor), I was given the character card of Sleepy Student. At the point I started snoring loudly, Pearl had the class get up for a stretching session (a Kaplowitz favorite!) In the second round I was chosen as the library instructor and had a heck of time - not only was I handed a card that told me the imaginary class projector failed, Pearl was given the Cell Phone Student card and would not stop talking out loud in class over her phone! I tried my best to get her to stop talking and put the phone away, but when she told me she was talking to her daughter, I suggested she take the conversation outside. It seemed to solve the issue. To conclude, Michelle and Brena had us recount what happened between the three groups and the strategies we tried to use for the various scenarios. They made many suggestions of their own as well. I recommend the collaborative notes page to see what the groups came up with. Chimene introduced us to two awesome tools, Fuzebox and Twiddla. Fuzzbox is a great way to demonstrate search strategies because it allows the library instructor to "push" their screen onto each students' lap computer (screenshare technology). Unfortunately, this is a only available with a paid account, but could be worth it for one-shot orientations when a projector is not available or students are spending their time checking their Facebook instead of watching the "big screen." Twiddla does not require a paid account (Chimene mentioned the educational account is best) and allows for collaborative document creation through a "Twiddla Session." It is kind of like a Google Doc collaborative session (which was utilized for SCIL Works this year - see the web page) but allows drawing and other tools. I hope to incorporate this tool into my library instruction. Copyright 2012. Jared Burton. Awesome Inc. theme. Powered by Blogger.